Improves the Speech perk tree so it makes more sense and is more useful. Merciful now works on NPCs under 20% health even if they aren't bleeding out. Honeyed Words leaves animals permanently non-hostile like Merciful does for NPCs. Yield attempts cancel if the enemy is made non-hostile through other methods before they finish. You can now yield with bows, crossbows, or spells. Speech experience for yielding doubled. Merciful awards 50% more Speech experience. Yield attempts cancel if enemy dies. Minor visual effect added when attempting a yield. Allure now 20% and affects yielding. Honeyed Words now makes yielding faster. Merciful's skill requirement raised to 45. Gold award formula changed. Honeyed Words perk added to improve yielding. Persuassion and Intimidation now augment the yield system. Yield system has been added for use during combat. Merciful now awards Speech experience. Merciful is now properly flagged as a Calm effect. Merciful's skill requirement dropped to make it available sooner for role players. Gold earned slightly lowered to compensate. Now available for Special Edition. In the base game, Speech is a poor skill and its perk tree isn't much better. With this mod, Speech becomes a powerful skill with a well-designed and useful perk tree. The tree was reorganized with prerequisites that actually make sense (plus it actually follows the constellation now). The criminal perks (Bribe and Fence) are separated on the left, the salesman perks (Allure, Merchant, Investor, Master Trader) are in the middle, and the speaking perks (Persuasion, Intimidate) are on the right. No longer are these three groups mixed around. Skill requirements were dropped on some things. Persuasion and Intimidate used to require such high Speech values that they weren't useful by the time you qualified, so I've dropped Persuasion to 20 and Intimidate to 40. Fence was dropped to 50 and Bribe to 25 to make them available earlier, and Fence's description no longer mentions an Investment requirement (both because Investor isn't its prerequisite anymore and because investing was never required to activate the sale of stolen items). Allure's effect was doubled from 10% to 20% because it was so unimpressive. A brand new yielding system exists for using Speech in combat. This doesn't require spending a perk; it's just something you can do now. While you are blocking, casting a spell, or aiming a bow or crossbow, activate a hostile NPC (only works on living, non-undead people) to attempt a yield. The screen will flash green to let you know a yield has been attempted. 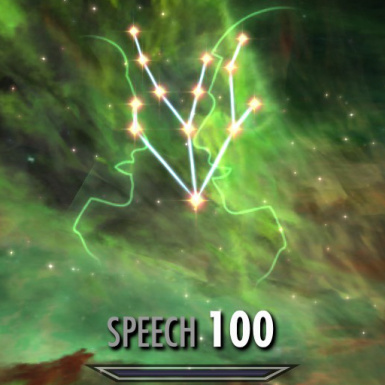 After a short five second delay, you either succeed or fail based on your Speech skill, the target's level, and the target's remaining health percentage. Success costs gold and awards Speech experience based on how difficult the opponent was, and the target becomes non-hostile. If you fail, you can try again 20 seconds after your attempt. This was carefully balanced in cost, reward, and success chance for you as you scale through levels. This system was designed so that Speech can be used as a combat skill, so don't just use it when you can't win a fight. For a small gold cost it can potentially end fights very quickly. Players who wish for a pacifist character will especially love this mod. I highly recommend using Dual Wield Parrying to expand your blocking options, which also expands your ability to yield. Persuasion, Intimidate, and Allure now have secondary effects to augment yielding. Persuasion drops the difficulty and gold cost of yielding by 30% (but doesn't lower experience earned). Intimidate adds your level to Speech skill for yield checks, making them easier. Allure drops yield costs by 20% on NPCs of your opposite gender. The success formula was very carefully balanced so that at lower levels, you should be able to occasionally succeed without perks, but against stronger enemies, you will need these to have any chance of success. I've also added four new perks. 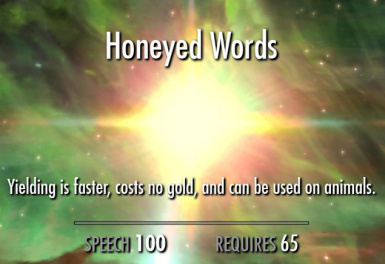 Honeyed Words (60, Persuasion) - Yielding is faster, costs no gold, and can be used on animals. I've heard about you and your honeyed words! This does exactly what it says: removes the gold cost for yielding (does not affect success chance or experience earned) and unlocks it for use on animals. It also lowers the yield time from 5 seconds to 2.5 seconds. 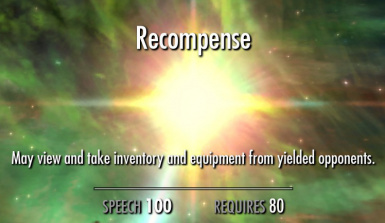 Recompense (80, Honeyed Words) - May view and take inventory and equipment from yielded opponents. This only works on people, not animals who've yielded from Honeyed Words. There's little reason to kill people once you have this. In addition, as a "hidden effect" this causes a small gold value to spawn on the target, so there will always be something decent to take. 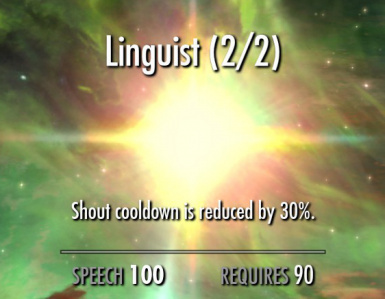 Linguist (60/90, Allure) - Shout cooldowns are 15% shorter. Has two ranks, letting you reduce shout cooldowns by 30% if you take both. This will stack with an amulet and blessing of Talos for a 70% potential cooldown reduction. 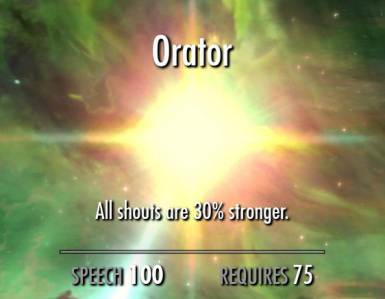 Orator (75, Linguist) - All shouts are 30% stronger. This increases both duration and magnitude of all shouts by 30%. Some shouts have both and will benefit from both parts.